This role can only see the specific checklist runs they have been invited to. They cannot see anything else in your account. The 'External' user role is to be utilized for people external to your organization such as clients, contractors and virtual assistants. 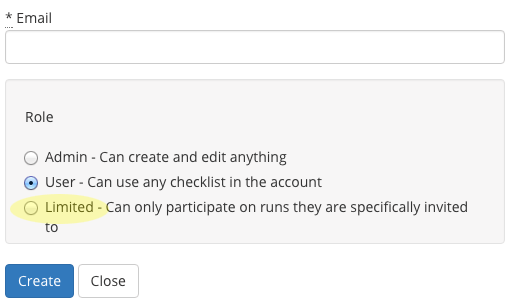 External users can only see the specific checklist runs they've been added to. They can't navigate to view your checklist templates and they can't see any checklist runs or any other settings. You can also limit their views on the checklists they are assigned to such that they only see the specific steps they are assigned to. Are they included in my organization's user count? They are not. You can have an unlimited number of these 'External' users and they won't count toward your account's user limit.